Imperium is one among the growing trends of films featuring high profile actors that sees a limited theater release while simultaneous on-demand release. It gained little attention in the mainstream press and even less attention with audiences. And that’s a shame because Imperium is actually a good movie. 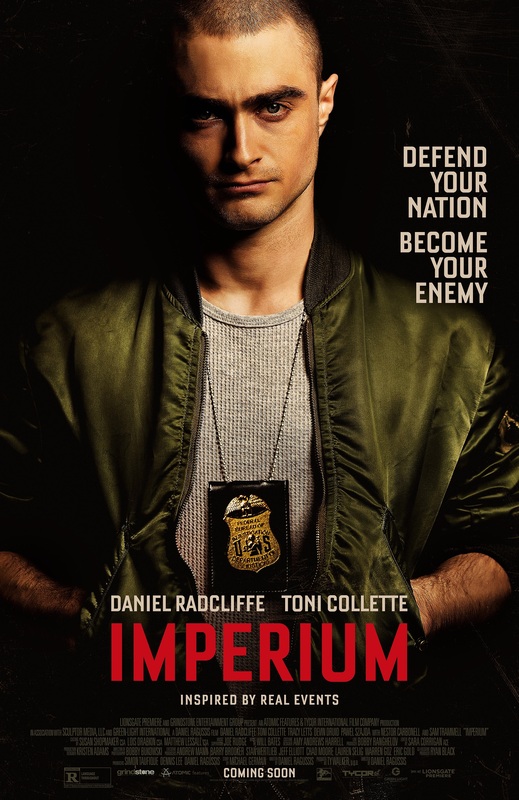 Imperium stars Daniel Radcliffe as Nate Foster, an idealistic FBI agent agrees to go undercover as a white supremacist. It also features Toni Collette as FBI agent Angela Zamparo, the lead in the undercover investigation as well as Foster’s handler. This is a big change for Nate Foster, he’s the type who goes home to an empty apartment with a bottle of fine wine while eating dinner reading a book and listening to classical music. Now he’s portraying an ex-Marine who has returned from Iraq with a plethora of grudges and some very specific ideas of who is responsible for them. He has to shave his head, lose the glasses, and immerse himself in the world of white supremacy. The story centers around the disappearance of several barrels of a dangerous chemical. One that can be used to create dirty bombs. Many in the FBI think that Islamic extremists are behind the disappearance, but Agent Zamparo is convinced that they should really be targeting a white-supremacist organization located outside of the Washington, D.C. area. She recruits Foster to go undercover and gain any evidence he can against the neo-Nazi’s. Foster’s search for information takes him on a tour of several different aspects of the modern white-supremacy movement. He starts with the lowest rung of the pecking order, the skinheads who are most eager to get messed up and instigate fights at the drop of a dime, but who are far too reckless and undisciplined to be entrusted with anything important. Once Foster is accepted by this group it opens up a world that is unfamiliar and also frightening. A step up from the skinheads are the brownshirt types who are a little more organized, but seem to have a much worse bark than bite. Then there’s Dallas Wolf, played by Tracy Letts, a secretive talk-radio show host of the Alex Jones variety who has fired them up with his broadcasts and books such as “Genocide: The Murder of White America.” Wolf is an instigator, but he’s more into it for the fame and money than anything else. He tells people what they want to hear so he’ll buy his book, but he still lives at home with his elderly mother. Then there’s the top ring, the real leaders of the white-supremacy movement. The people that come across as the most reasonable, the ones with the picture-perfect family with well paying jobs. They’re the ones that can organize the various groups into something more. They have the ambition and the means necessary to move the movement ahead. This group is led by Gerry, played by Sam Trammell, a well-off member of the organization who comes across level headed and smart. He’s an engineer living in the suburbs with his family, hosting barbecues that bring the various factions together, he’s a vegetarian and not only does he listen to classical music, he even admits that the recordings by Leonard Bernstein are his favorite. It’s this group that Foster tries to immerse himself into the most, making the connection with Gerry over the classical music. Just when he thinks the investigation is going nowhere does he get a surprise. There are some issues with the film, but one could argue that they’re inherit to this type of movie in general. You’ll find the clichéd wife passing around cupcakes with swastikas to the cute kids talk about the upcoming race war. And yes, there does seem to be an issue with just how quickly Foster rises through the ranks of the various organizations to become friends with the top guy. Yet despite some of the cliché’s it’s still a good film. It’s still enjoyable, and at the same time it’s scary to think that this can be real. There really are organizations that think this way and try to recruit people to their cause. It’s not a topic that’s covered a lot in the media, so it’s refreshing to see a film tackle these organizations. They even pepper in some actual clips from various sources to give it a more realistic feel. Radcliffe is terrific as the wide-eyed agent who must quickly adapt to the constant danger he finds himself in. His American accent was convincing and sounded natural. While he may look young, he still commands the screen which is necessary considering the type of people he has to go up against. Another plus as to what works is the simplicity of the story. This is a grounded in reality, one that explores what a person has to go through while undercover. How they can get sucked into their work, and how they have to keep reminding themselves that it’s just a job. Imperium is a good film. It manages to create some fascinating characters that are all facing their own struggles. Of course, none of it would have worked without a solid actor in the leading role, and you can’t do much better than Radcliffe.